You'll need a shuttle for this trip, unless you are a very fast hiker, staying overnight, or have all day to do it. From State College, PA, take 2 cars on Route 322 East, past Boalsburg (5mi) and Potter's Mills (9mi). After bearing right at the intersection of routes 144 and 322 in Potter's Mills, the road turns into a divided highway after passing through a small gap. At the top of the long hill, you will pass a truck pull-off for vehicles over 21,000 pounds. A bit later, you'll see a runaway truck ramp. Just past here is Stone Creek Road, but you'll need to pass this so that you can arrange your shuttle car. Continue on 322 until you see the exit for Milroy. Take this exit, which takes you back over 322. Make the first left to get back onto 322, heading back the way you just came. Heading back up the hill, and past the reservoir, you might notice the signpost for the Mid State Trail on the edge of Long Mountain. It's hard to miss, especially since you're doing a pretty good clip when you pass it. 1. You can park at the Seven Mountains Scout Camp with permission and ask them about the trail that leads to the Big Valley Vista. If you started at Penn Roosevelt SP, it's easy to find near the blue-blazed trail after the Big Valley Vista. 2. You may use the Ben Jacobs Jeep trail as described in the Mid State Trail Guide. 3. If you have 4wd or like to abuse your family sedan, you can go past the Seven Mountains Scout Camp and turn south on Stillhouse Hollow Road. The MST intersects that road near a small bridge. The hike up/down the hill to the west is a great one, and well worth the extra effort, but add an hour or so to the hiking time. Take your other car and bear right (one way) and take the first left turn about a mile down the road. This makes a U-turn. Head back up the hill. Pay attention! Not too many folks will expect you to make the right turn onto Stone Creek Road, which is just past the runaway truck ramp. You'll see a sign that says "Penn Roosevelt State Park - 4 miles", but the turn is rather obvious if you keep your speed to a minimum. Take your time on this bumpy road, and in about 3 miles you'll see a sign directing you to turn right onto Penn Roosevelt Road. Follow this road to Penn Roosevelt State Park. When you reach the fork in the road, bear left. Park your car in the spaces provided. Some people say that there is a limit of 2 hours parking at the roadside rest, but I've not been hassled about it. If you're concerned, you could have somebody drop you off there instead of parking, and hike this in reverse. As with anything on this web site, the information is simply a record of what's worked for us. Hopefully, you'll be able to enjoy these hikes, but remember--you hike at your own risk! Since this is part of the Mid State Trail, you may want to bring your MST guide and maps. The guide book is an invaluable resource for the area, and in addition to trail information, it's chock full of local history. Be aware, though, that while the MST map of this area is helpful, it's not complete. This is not the fault of the mapmakers, but it's inherent in any representation of a living, growing thing. Use it as a guide, but don't expect everything to be on it, and don't expect it to be 100% accurate. Exploring is part of the fun, and the MST and HikePA maps are certainly enough to get you where you're going. You start your hike by heading toward the spillway on the dam. Potter Run feeds the reservoir, which was built by the CCC as a flood control measure. Cross the spillway on the footbridges and look for the orange blazes of the Mid State Trail--they'll take you across the road and up the hill, which is Broad Mountain. The climb up Broad Mountain is steep and there are no switchbacks. It's about 700 feet until you reach the very top, but the worst part is right at the beginning, so take your time and don't get into oxygen debt too early--you have a long way to go. If you stop and turn around from time to time, you'll be amazed at how fast you rise above the road. The first point of interest is about 2km in (the Mid State Trail is measured in kilometers). There is a USGS marker on a pile of rocks indicating the intersection of Centre, Mifflin and Huntingdon Counties. The Tar Pit Trail leads to Crowfield Road to your left, and Stone Creek Road to your Right. The next point of interest is a while away, but the walk in the woods is nice, and you'll notice a variety of plant and animal life. The area is covered with Mountain Laurel, blueberries, Red Oak and some pines. After a fashion, you reach the first of several vistas that come after you cross sides. Your hike continues on the top of broad mountain and the trail takes you through a stand of four dead oak trees. Probably there was one in the center, and what remains are the stump sprouts of the original. Soon you'll pass a signpost marking the Indian trail, which the MST follows for a while in order to cross over to Bald Mountain, which is where the best views are. After crossing the side of the hill, several vistas (marked on the map) open up. There are two looking north, separated by a few dozen yards, and one that is pretty close to the 'first' one. I say first and second because there are signs directing you to them from the MST, but the best view is has no path to it. More later . . . The hike gets a bit boring and harsh in the next section, which is extremely rocky, rivaling the Jackson Trail 40km to the west. What are you looking at? Well, the ridge in the distance is Nittany Ridge, and if you follow it to the left, you can just see where the top disappears beneath Tussey Mountain, which is quite a bit closer on your left. if you're lucky, you can just see Bald Eagle Ridge through Pleasant Gap, which is directly in front of you in Nittany Ridge. Pleasant Gap is the one furthest from you, while Boal Gap is the one closer to you. Thickhead mountain, which was behind you as you started this hike, is on your left, one of the little hills to your right is Triester Mountain and just beyond is First Mountain, which is what Boal Gap cuts through. Sand Mountain is the long, interrupted hill just in front of you. Some folks call the mountain around Pleasant Gap "Centre Hall Mountain", but it's really just an extension of Nittany. 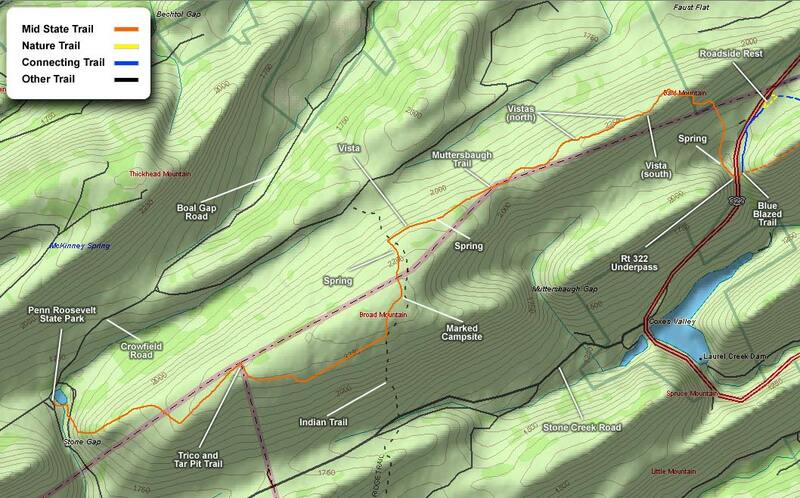 If you look at a topo map, you can see that the Nittany Ridge continues for some distance, with a high valley saddled in between its peaks. The vista you're at is nice, but if you look to the right on the scree slope, you'll see a little wall that has been built. This is a better view, although there's no clear path to it from the MST. You can either bushwhack to it from the MST, or you can scramble over the rocks, which is probably easier. This is a very nice place to stop and have a snack, take photos, or just sit and relax. A few dozen yards further and you'll come to another view of the same valley, except this one is a bit easier to get to, and there's a nice dead tree offering some interesting foreground (see photos). After crossing through the interminable rocks, a nice vista opens up to the south, and on a clear day, according to the MST trail guide, you can see the mountains beyond the Juniata. It's quite nice. The really big ridge in the distance is Jack's Mountain, the one closest to you is Sand Hole Ridge (which is rally the edge of Stone Mountain) to the left and another Broad Mountain on your right (not to be confused with the one you just climbed up, but a lovely hike with a fire tower on the Greenwood Spur of the MST, also called the Johnson trail). Front Mountain is the one most directly in front of you on the left. If it's clear, you can see the mountains beyond, possibly including Shade Mountain and Blue Mountain, which is home to the Appalachian Trail in Pennsylvania. This is about as close as you'll get to it on the MST, though. Moving right along, you being your long descent down an extremely rocky path. There is a switchback that is not double blazed, and this section of trail is very much in need of some trail maintenance. When you reach the bottom, the flavor of the trail changes quite a bit. If you haven't heard it already, 322 is making a lot of noise to your left, and by the time you get to the signpost at the Ben Jacobs Jeep Trail, the mix of hiking in the woods and high-speed traffic creates a surreal setting. The trail here generally bears right, so don't get excited and start heading for the road just yet. About 50 yards before the underpass, you'll cross what seems to be a 10 foot wide ditch. This is the remains of the Bellefonte-Lewisburg Pike, which was the main road through these parts in the 19th century. Most of the route is gone now, buried under 322, but it is rumored to have been a genuine Native American trail at one time. Many of the so-called "Indian" trails, including the one you passed on top of Broad Mountain, are not at all what their names would indicate. This one probably was. Passing under 322 is a weird experience. It's not quite high enough to stand up, and you can hear the roar of the fast moving traffic just a couple feet above your head. it's only recently that this culvert had the sidewalk installed with a grant. Contrary to what you may have heard, the underpass was created for the stream to pass through, and not for the hiking community. On the east side of the culvert, you'll see the signpost you passed while placing your shuttle car. hike up to it as best you can and follow the orange blazed MST about 200 feet up, where you'll see a signpost and the blue-blazed connecting trail. The bluer-blazed trail comes to a fork with two yellow blazed trails. Either will get you where you want to go, and they are, in fact, a loop, but the left side is the shortest route back to your car, and if you want to do the whole loop, you might want to get a brochure from there anyway. If you're so inclined (no pun intended! ), instead of taking the blue-blazed trail, you can continue on the MST up to the Big Valley Vista. Frankly, I don't think it's worth the effort, since you've already seen a nearly identical view from Bald Mountain. The climb is another 500 feet, so if you feel up to it, just go to the vista, and head back on the 'other' blue blazed trail, which will lead you back to the yellow-blazed nature trail and your car. To get your other car, simply go back the same way in which you dropped it off.